The cakes demonstrate the enormous and diverse contribution that the migrant workers make to our community. In every generation people have moved to our town they have enhanced our society by their hard work and cultural impact. 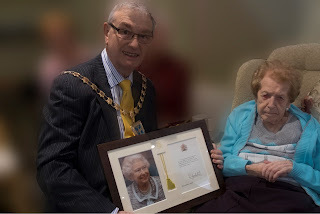 There was more cake at the 100th birthday celebration for Josephine Coulton at her Park Lane nursing home. It was good to see so many family and friends gathered together for the party especially those from Leyland Rd Methodist church who turned up to sing Happy Birthday to her. Josephine belong to St Marks which joined together with Leyland Rd. It used to be called the ‘Jam Chapel’. Christiana Hartley,arguably my most illustrious predecessor as Mayor, belonged there. In 1921 she was the town’s first female Mayor and was a pioneer of social reform. 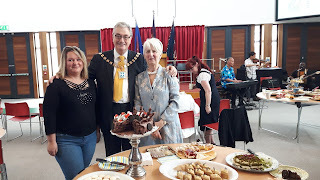 This week I also attended the Lydiate Festival, held a Civic reception for those involved with the tourism sector in the town, and attended a charity cricket match at Churchtown cricket club and as you may have guessed there was cake at most of the engagements. groups have produced. I found that I was holding a competition in my mind as to who was the best. As my term of office draws to a close I think it is time to declare a winner. For a long time Maghull Baptist Church led the bake off. Highly commended goes Clarence High School, Age Concern Crosby, St Luke's Crosby, the amazing Guinness Cake at Mrs & Mrs Fletchers whose home was open as part of the National Garden Scheme, Grosvenor Rd URC Birkdale and the MacMillan Coffee Morning in Marshside. But the undoubted winner was the 'Cakes of the World' celebration held by the Migrant Workers' Community last weekend.